I love Christmas. My sister and I used to set the alarm early because we were allowed to open our presents from Santa before my parents were up. I still remember my delight when pulling the original Power Rangers Movie out of my stocking; it was the perfect gift. For most of us Americans, our greatest nostalgic moments tie back to one common theme: family. But for too many in our country, life circumstances pull children away from safe homes, and they are left to the care of the community. This is why we, at Better Finds, are so thrilled to partner with Olive Crest, an organization transforming the lives of at-risk children through the healing power of family. Below, learn more about their incredible work through my conversation with Kelsey Parker, Associate Development Director of Olive Crest. Jonathan (Better Finds): What is Olive Crest’s purpose in the community? Kelsey (Olive Crest): Olive Crest is dedicated to preventing child abuse, treating and educating at-risk children and preserving the family one life at a time. 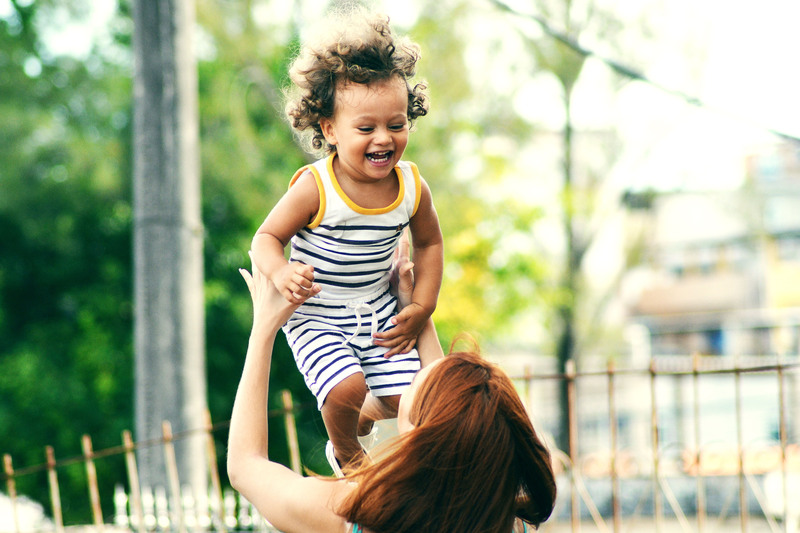 We find and license foster parents, place children in homes and support the parents and kids as they go on this beautiful, but oftentimes difficult journey of becoming foster parents. Through our strategic partnerships, Olive Crest will solve 44% of the crisis in Washington state. There are currently over 8,000 kids in foster care, with 1,655 of those kids sleeping in hotel rooms and Department of Social and Health Services’ (DSHS) offices. We will find and license over 400 new foster families. Jonathan (Better Finds): What an amazing goal! It sounds like you have lots of experience and have already been changing lives. Can you dive deeper and tell me a story about someone whose life has been changed because of Olive Crest? Kelsey (Olive Crest): Of course. Susan, age five, was found in a shed behind her family’s house. She was locked inside the dusty, dark space while her parents grew and sold marijuana. Tragically, she never attended school, didn’t know how to use utensils, and her teeth and mouth hurt from never going to the dentist. When Child Protective Services came to take her away, she felt scared and confused, unable to understand what was happening. Then, Susan went to live with an Olive Crest foster family, where she was welcomed into their home, given her own room, and surrounded with the love she had never received. Her new family patiently nurtured her and cared for her physical and emotional needs, teaching her to brush her teeth, use a fork and knife, make her new bed and connect with others. With the help of Olive Crest’s team, she learned to trust her foster family, was integrated into a school where she began to thrive and learned that she belonged. What a difference a safe and loving home makes in transforming the life of a hurting child. Jonathan (Better Finds): What a difference, indeed. Susan is lucky to have an agency like Olive Crest help her through this emotionally taxing process. 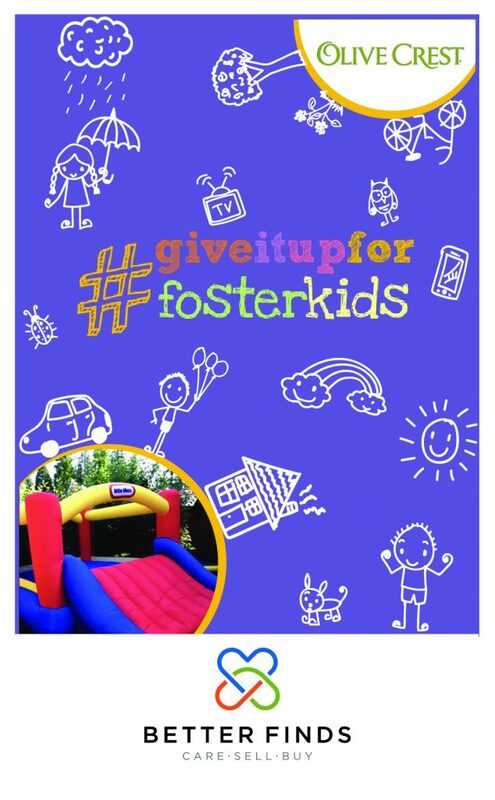 So Kelsey, you are partnering with Better Finds in particular to support a new campaign called #GiveItUpForFosterKids. Can you tell me more? Kelsey (Olive Crest): #GiveItUpForFosterKids is a nomination campaign, much like the Ice Bucket Challenge which raised $115 million for ALS research, where you take an action for a cause and then challenge friends to take that same action. In our case, we are asking people to “give up” unused items in their home to support foster kids through the Better Finds marketplace, and then share and tag friends to also give up items for those kids as well. Jonathan (Better Finds): What a clever idea! So why Better Finds? Why are you excited about this partnership? Kelsey (Olive Crest): It is always incredibly exciting when you find an enthusiastic advocate. Better Finds has been just that. They have chosen to advocate for these kids who do not have a voice. Through the partnership, I hope to raise awareness about the crisis in our state and also raise funds to help support these foster kids and their families. Jonathan (Better Finds): Before we wrap up, is there anything you want to tell the Better Finds community? Kelsey (Olive Crest): Foster kids need your help! As a community, we need to surround them. There is a crisis in Washington state, currently with 1,655 kids having no place to go. We need everyone to participate in putting an end to this.